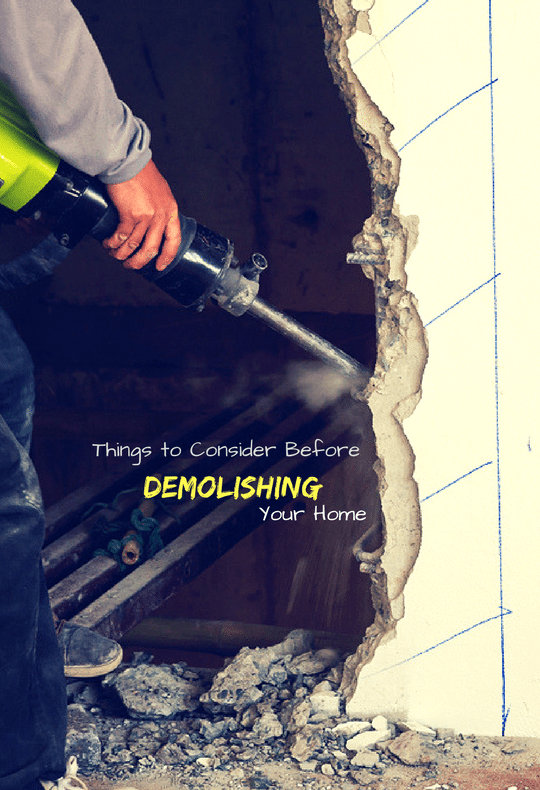 The idea of demolishing your home can be disconcerting at first, but the demolition phase is actually the fastest and most exciting phase of the construction process. A complete demolition is pretty easy, and should be over within a day, maybe two; a remodel, however, is usually a bit more challenging. Demolition is typically fast and messy, but it is anything but mindless and hopelessly simple. There are a number of things that you should know before the demo actually begins – going in headfirst without a clear strategy can lead to significant cost implications later on. All the more reason to go in armed with professional advice and the right builder. Having the right choice of both makes it an exciting start towards building your brand-new home. It may come as a surprise to you, but often, the cost of demolition and building a new house are comparable to each other. Before you get ready to tear down those walls, here are a few things that you need to consider. What kind of demolition do you need? Demolition doesn’t necessarily involve knocking the entire house down. You can actually choose to demolish just a part of the existing structure, leaving a particular wall or facade up. This is often the choice when you wish to retain some part of its original heritage or if you only want to improve a certain section of the building that you are not satisfied with and leave the rest intact. Demolition is anything but straightforward and cost-effective. The closest comparison to it is actually surgery, and as such, there are experienced demolition experts who specialised in it. An experienced crew will know what to keep and what part of your building to tear-out. Ideally, the framing crew should take on the demo; they will know best what to retain and the accountability chain will remain direct. The demolition company you choose should be willing and able to deal with the local authorities on your behalf, acquiring the required permits and making sure the project stays on the right side of local regulations. A demolition permit sometimes referred to as a ‘building permit’, is required by the law and must be obtained from your local council prior to any demolition work taking place. Some relevant paperwork may also be required, such as the land title deed and site plan. You should, however, be aware that obtaining a permit for can take up to 15 working days, so prepare accordingly. There is honestly no way to sugar-coat it. Demolition work is noisy, dusty, and dirty. Be sure to inform your neighbours beforehand, perhaps take over a bottle of wine as a courtesy for the inconvenience. It’s all human courtesy, really, and will at least help them prepare for the imminent chaos that will follow, and they can take steps to minimise the mess that may spread onto their property. It’ll help you avoid angry protests against you later too. If there’s a giant tree in your garden blocking the path of the building or any other kind of vegetation that seems like it will be troublesome, arrange to have it removed before the demolition. This will make the demolition site much easier to access and work on when the demo crew finally gets there. Asbestos should be put on the highest side of the priority scale because nothing will shut your project down faster than an asbestos violation. It’s worth doing your homework. If any part of your home contains asbestos, have the site inspected and any harmful materials properly removed. There are a few key points worth highlighting since they can save a lot of time and money on a project. If asbestos is identified at a construction (or demolition) site, it can be left in place and encapsulated so as to avoid any costly inspections and subsequent removal procedures. The homeowner who occupies the house can undertake minor asbestos removal themselves if they feel comfortable doing so. There are procedures for each of these and some of the requirements vary from one jurisdiction to the next, so ensure you review this for the details. Demolition doesn’t have to entirely be about destruction. You’d be surprised to find out just how many of the items from your demolished home can be reused and/or recycled.There are several stores all over that accept items like appliances, windows, doorframes, and cabinets, given, of course, that they are in decent shape. These offer tax deductions that can add up over the course of your demolition project. A decent chunk of your budget will go on the demo itself, but since nothing is entirely possible to predict, you may end up spending up to 110% of your funds on only a small portion of the demo. Because there are so many variables in the demolition phase, a contingency will be needed and inevitably used. Once the demo is completed, these variables will level out. Your contingency funds are meant to prepare you for all the surprises that pop up during construction work – a hike in the price of plywood, or the need to transport asbestos out of the site. Anything could come up during the process and you should prepare accordingly.